Foundation is one of those makeup products that so many of us have a hard time mastering. Many of us have issues finding the right shade – women of color are women with tones and undertones. Makeup brands are just now catching up with our needs and expanding their shade ranges to suit. Also, there are so many makes and finishes of foundation. Powder? Cream? Cream to powder? Powder to cream? Mineral? What does one begin, if you’re a foundation newbie or just seeking a brand that fits your needs? Here’s some practical advice from my go-to Los Angeles makeup artist, Nicole Evans. She breaks down tips for you to make an informed makeup decision. 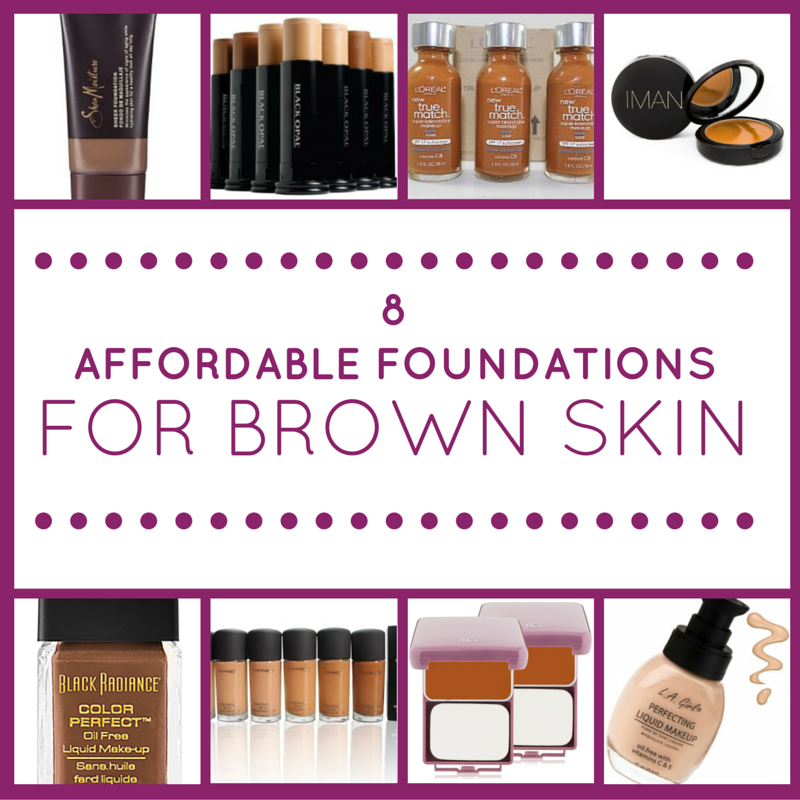 And keep reading for my top picks of 8 affordable foundations for brown skin! Take it away, Nicole! 1. What does your skin look like and how would you like it to look? For help with this answer, take a look at people around you, in magazines, or even on television whose skin has a quality that you admire or want to emulate. Take note of that. The right foundation will help you achieve that. 2. Know your skin type: Are you dry? Oily? Combination? Sensitive? Are you already using the skincare regimen that keeps your skin in a state you are happy with? I caution you not to use foundation to mask skincare concerns, and instead to embellish and perfect what you are already happy with. The better you know your skin type and take care of it accordingly, the less you will need to rely on foundation. 3. Color: I have tried many great ways of finding the right color, this is always tricky, no matter the shade of skin. This is the simplest way of matching a foundation that I have found; match to the tone of your neck or décolletage. The reason this works the best is because the skin on your face is thinner in certain areas, which causes the color to differ and can make it difficult to find one shade to match the whole face and still look natural. When you see someone who looks as if they are wearing the wrong shade of foundation, this is usually because their head doesn’t match their body. This is never a good look. The skin on your neck/upper chest area is denser, therefore, more even toned. If you match to the tone of your neck/upper chest area that won’t happen. Thank you, Nicole! Check out NicoleEvansBeauty.com for more of Nicole’s work. You can also check her out on Facebook, Twitter and Instagram. OK. So now you’re armed with the info you need, let’s talk about the products that are available for our needs. Some brands are still out there with their six-shade-struggle. Others are going above and beyond to offer consumers products to cover our needs, in all shades of beautiful. Here are 8 of the top foundation brands for women of color, all offering quality coverage, all offering products that all cost under $30. Hence, affordable. Black Opal makes stick foundations, creme to powder, and liquid foundation for brown skin in a variety of shades. Click here to buy. Black Radiance makes liquid and powder foundation for deep skin tones. Click here to buy. CoverGirl Queen Collection offers liquid makeup, and a Natural Hue compact cream foundation that rocks. Click here to buy. Iman Cosmetics prides itself on its foundations, and you can choose between Second to None cream to powder, liquid foundation, or stick foundation. Click here to buy. LA Girl has gotten a lot of love online for having a wide range of concealers. Their liquid foundation also gets raves (peep Style & Beauty Doc’s review). Available at beauty supply stores. L’Oreal True Match is beloved by many women of color because their product comes in such a wide range of shades, from light to dark with everything in between. Click here to buy. SheaMoisture is new on the makeup scene but don’t sleep! They’ve got so many shades in their foundation line. It’s pretty impressive. Click here to buy. MAC. Yep, MAC offers two foundations for less than $30! Click here to shop 46 shades of their Studio Fix Powder Plus or Studio Fix Fluid SPF 17 (currently $27). Hope this helps you find exactly what you’re looking for. Tell me your foundation woes and needs! What’s your favorite brand of foundation? Great list here! Will definitely have to check out some of these. I’ve used True Match before but I’ve wanted to try out MAC’s for forever. I have been searching for a good foundation for my oily skin, but the results are not satisfactory, and after using 5 different brand’s foundation I thought that I should get any other alternate , but after reading this article I think I can use any one of these. Thanks for sharing! I also recommend checking out Beausoleil Organics and their great new line of cosmetics. I am a beauty blogger for this startup company and they have wonderful foundations for every skin tone! LUV Mineral Cosmetics offers 15 shades of loose mineral foundation, 6 liquid mineral foundation and 3 BB Cream shades all specifically formulated for brown skin. The brand is an all natural and organic brand for those that are interested in avoiding toxic ingredients in makeup. To try the line visit http://www.luvmineralcosmetics.com, @luvmineralcosmetics on Facebook and Instagram or contact one of our Independent Beauty Advisors many of which are MUA, master cosmetologists and aestheticians.